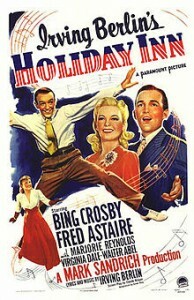 One of my all-time favorite movies is Holiday Inn, featuring Bing Crosby & Fred Astaire. For the uninitiated, Bing Crosby, spurned in romance and fed up with his showbiz career, opens up an inn in Connecticut that is only open for holidays throughout the year. The film is well known for first introducing the song White Christmas to the world. Though the plot line is barely plausible, the song and dance numbers that showcase an Irving Berlin songbook are delightful. 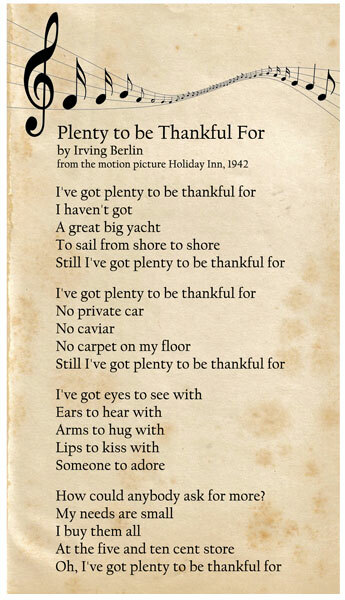 Later in the movie after Bing has lost the girl once again, he sits down to Thanksgiving dinner and does what any normal man alone on Thanksgiving would do; he plays a record of himself singing “I’ve Plenty to be Thankful for.” As he serves himself Thanksgiving dinner to the strains of the song, Bing argues with the recording’s claims that he does have plenty to be thankful for. Thanks to the modern marvel of YouTube, you can see Bing croon for about one minute by clicking HERE. Over the years, I sing the lines I can remember from the song, rarely getting the tune correct, but loving the sentiment. To the left are the lyrics to the song. What you don’t see in the YouTube clip is the scene a few seconds later when Bing’s maid chastises him for feeling sorry for himself, and admonishes him to go get the girl. In a country where we are inundated with ads insisting that we somehow deserve credit, full bellies, and healthcare, it is all to easy to focus on what we don’t have, rather that what we do. It is all to easy to believe that we deserve a constant serving of good fortune and happiness, leaving us to concentrate on our lack rather than our abundance. During this past Thanksgiving week, most of us have reflected on that for which we are thankful. It is good to stop periodically and focus on our blessings. Berlin’s song asks how could we ask for more, if we have eyes to see with, ears to hear with, arms to hug with, lips to kiss with, and someone to adore? Certainly, I believe that is true. Whether it be from maturing years or greater spiritual insight, I am convinced that the most important things in life aren’t things. They are relationships–with God and other people. 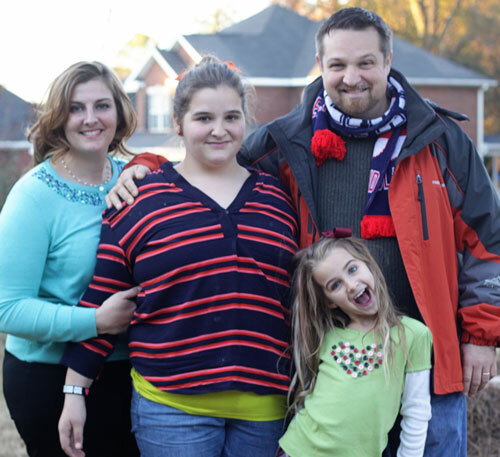 As Mark left the house Thanksgiving evening for dialysis, leaving Lisa, Kelley & Emlyn behind, I pondered that their family would not be denied an extra quota of complaints should they choose to exercise their right. Yet, they took it in stride, choosing to be grateful for the time spent together. I reflected that though Mark is in kidney failure, he has the opportunity for a lifesaving organ transplant. He has tremendous doctors watching out for his health. He has awesome caregivers that were working Thanksgiving instead of spending time with their families. He still has a job to provide for his family. 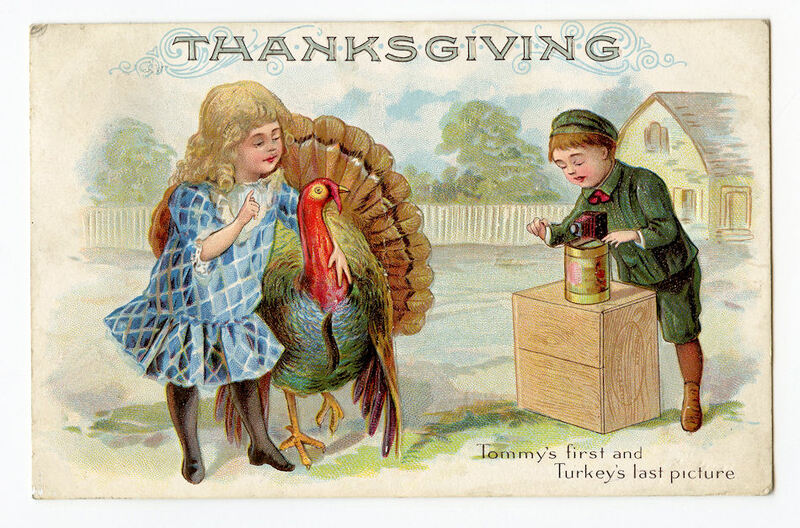 We can be thankful that the rest of us are in pretty good health. We have a lovely home, cars to drive, way too much food in our bellies, and clothes and shoes to wear. Most of all, we are blessed with people we love, who also love us. Family. Friends. Church community. Co-workers. You are those people and at Thanksgiving we thank you for your friendship, love and prayers. We are also thankful for those of you who have purchased poinsettias for our fundraiser. We are overwhelmed with your kindness. We always thank God for all of you, mentioning you in our prayers. We continually remember before our God and Father your work produced by faith, your labor prompted by love, and your endurance inspired by hope in our Lord Jesus Christ. 1 Thess 1:2-3.